The emancipatory effect of direct execution on the open wall surface coupled with the decisiveness of black on white shapes up a distinct collective energy among wildly idiosyncratic image creators. 637 Running Feet: Black on White Wall Drawings by 14 Artists presents diverse styles and methods from figuration to abstract geometry and from narrative to symbolism. Artists incorporate site-specificity in their subjects or negotiate spatial characteristics in works made in precise draftsmanship, rolling pen and ink, stretches of masking tape, and acrobatic gestures in house paint. Furthering drawing’s privileges of immediacy, these artists productively contest subjectivity of the image and cultural symbols. 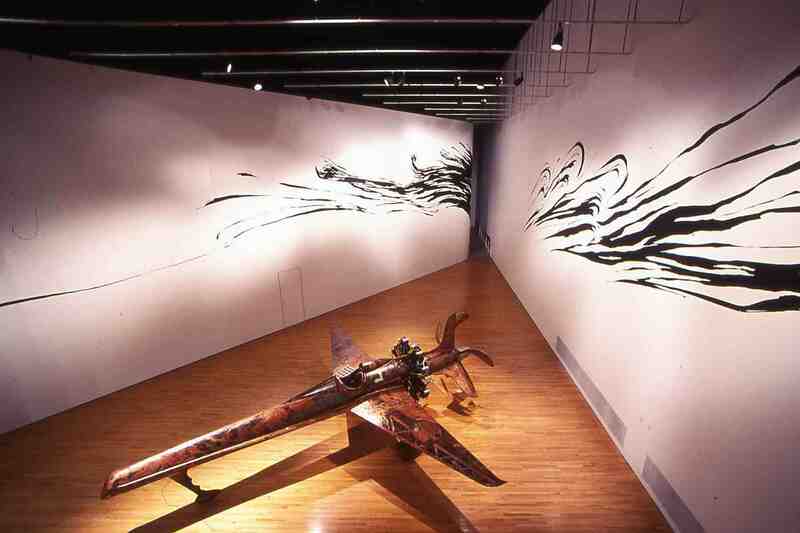 This exhibition will be on view December 15, 2002 – March 2, 2003. An opening reception will be held January 12, 2003.